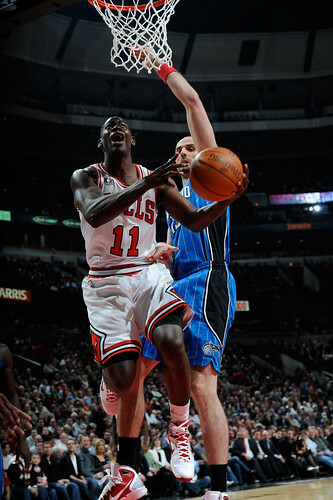 It was a bad night for the Bulls Wednesday against the Orlando Magic in the United Center. So how bad was it? 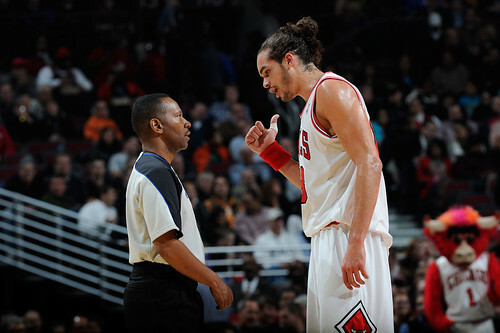 It was so bad that it was Joakim Noah bobblehead night. And Noah’s bobblehead got the same number of rebounds that Noah got. Zero. It was supposed to be a celebration that turned into a humiliation. Carlos Boozer, the much anticipated big free agent acquisition from the great Summer of Free Agency, finally made his debut after breaking his hand in training camp. And you’d hardly have noticed with an invisible five points and two rebounds in 22 minutes. “I had high expectations for this game,” Boozer gloomily conceded afterward. “The reality, unfortunately, is I’ve got work to do to work my way back in and that’s what I plan on doing. “As far as the injury, it (feels) great,” said Boozer. “It took me five, six minutes to get the speed of the game. I’m in a down mood now because we got beat so bad. We’re going to play a lot better than that; I’m going to play a lot better than that. No one is blaming Boozer. Actually, I didn’t even think he should have played after just two practices since being declared medically ready. I’m sure he’s healed, but not only does he need time to adjust to the team, the team needs time to adjust to him. Maybe he should have come off the bench to start and worked in at increments. Though you generally don’t bring in a star and start him on the bench. So it figured to be shaky, and it was. The Bulls never imagined it could be that uncertain, but you could see Boozer and Derrick Rose hesitant when and if to run screen/roll, and if so where. You saw Luol Deng unsure where he was getting the ball, and it was a difficult matchup on defense for Boozer with the quicker Rashard Lewis, who kept losing Boozer, thus causing switches and players rotating out of position. The result was the usually unaggressive Vince Carter, who had 22 points to go along with a game high 24 from Jameer Nelson, getting two tipins for scores in the first quarter. Carter, notorious for avoiding contact, had four offensive rebounds. The entire Bulls starting lineup combined for one offensive rebound. 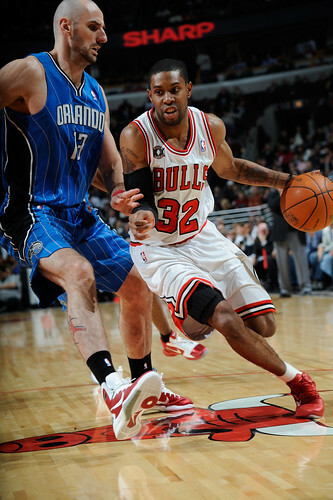 The Magic pummeled the Bulls 27-10 in second chance points, usually a specialty of this Bulls team. And Magic coach Stan Van Gundy said he wasn’t the least bit surprised, though Van Gundy did say he was surprised how well his team played, the best all season, he said, and especially Carter, whom he said hasn’t played close to like he did Wednesday. Being trailed by Keith Bogans probably helped some. No offense to Bogans, who works hard. But he was brought in to be a deep backup used for emergencies. It is time to get Ronnie Brewer in with that starting group and see if they can do a bit better with those first and third quarter starts. 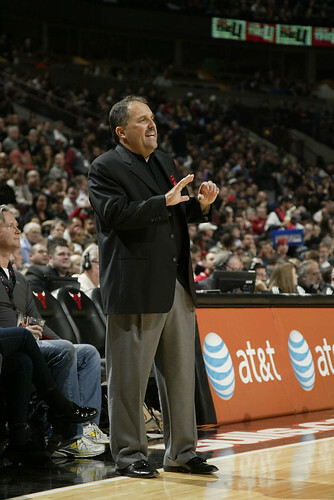 “Carlos is a great player and he is going to help them a lot,” said Van Gundy. “But it’s actually to their disadvantage when he first comes back because they’ve developed a good rhythm without him. I’ve been in his situation before and I would have done exactly what Tom did. You do not bring a guy like that off the bench. You’ve got a season; you’re getting ready for the playoffs. You need every game with the rotation you are going to play. You know Carlos Boozer is going to be a starter. You’ve got to start the process sometime. I’m sure Tom knew going in it’s sort of like starting over for them. It probably was to our advantage tonight it was his first game back. But this game, the fewest points the Bulls have scored all season by 10, never within 15 after the middle of the second quarter, was more than the problems of adjusting to Boozer and Boozer not able to produce much. Noah, the league’s second leading rebounder, got pushed around and distracted by Dwight Howard, who had 13 points and 12 rebounds. Noah seemed so distracted by trying to stop Howard that Noah failed to give almost any help for the guards off the pick and roll, and Rose was losing Nelson on screens as Nelson added nine assists to his 24 points and the four rebounds of the 5-10 (or whatever) Nelson matched the Bulls high by Deng and Taj Gibson. The Bulls now are 9-7 and a half game up in the Central on the league’s best defensive rebounding team, the Pacers. 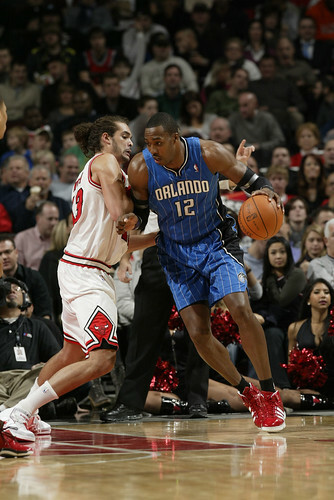 The Magic is 14-4, so we will hold off on those Bulls championship predictions a bit longer. Nelson continually got inside and it looked like one of those chariot scenes from the gladiator movies with the races through the squares and people scattering all over the place. Boozer was losing Lewis and yelling for help. But Noah didn’t want to leave Howard, so Bogans would rotate and Carter would slash inside to the boards. Yes, that Vince Carter! Quentin Richardson would flair out for a three as Deng tried to rotate back, and Richardson would get an open three. Or Lewis. Or Nelson coming back on the weak side for the ball rotation. Each made three. The Bulls combined for four three pointers. Not that we shouldn’t have seen all this coming. 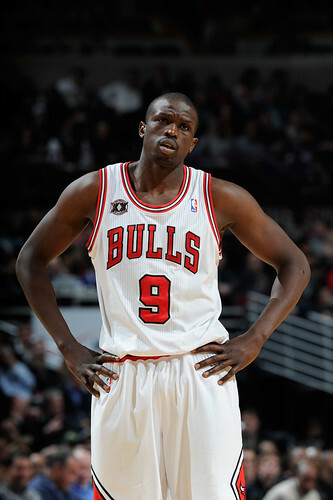 The Bulls now have two 6-9 forwards from Duke, so when announcer Tommy Edwards introduced, “The 6-9 forward from Duke…,” Luol Deng ran out. And Edwards mentioned Boozer. Then in introducing Deng, Boozer ran out. Right, if they can’t get the intros right, how are they going to get the coverages right? 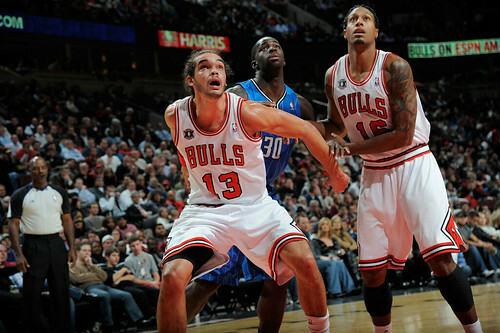 I didn’t disagree with the Bulls plan on Howard, which was not to double team or help Noah much. I think the Bulls get in too much trouble, anyway, when they double because they are not the greatest athletes and their rotations suffer. 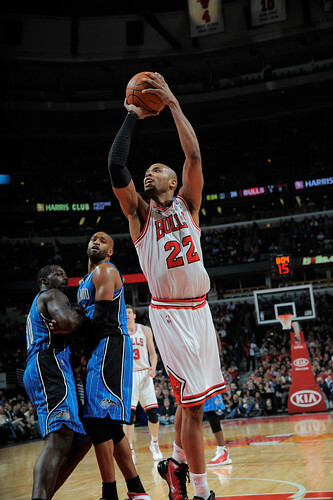 Plus, the Magic get going when their three point shooters begin to hit, so the Bulls elected to stay home with Howard. And Howard did have just 13 points. The first quarter, actually, was respectable as Rose scored nine points on four of five shooting and the Bulls trailed 28-22 and shot 55.6 percent. But it was the old, perimeter Bulls as the vast majority of the Bulls shots were jumpers, including by Rose who didn’t go to the basket once in that first quarter. He finished the game with 15 points, mostly on jumpers. 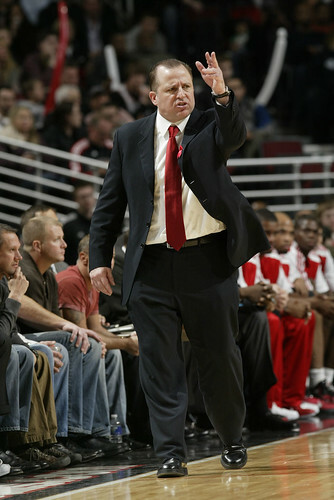 It was last season that Howard violently took down Rose twice, which may have sent a message that carried over. Though Rose also seemed to be trying to feel out Boozer’s tendencies. Howard, for his part, again insisted he never intended to hurt Rose despite what some have suggested. Well, his pride wasn’t feeling so good Wednesday. Rose seemed, perhaps, to be deferring to Boozer in staying away from driving and attacking the basket. With Boozer setting up in the post, it did appear Rose was trying to get a feel for what Boozer could or would do or where he would be. After all, once the season begins teams rarely scrimmage or during practice are in live game situations. So it’s unlikely since just starting practice this week Boozer even got much live game type action before going into a game against one of the league’s best teams. And going through drills is a lot different than seeing what someone will do when the defense is paying attention. And the Magic’s was on Wednesday. Carter was unusually engaged as coming in there had been talk in Orlando that perhaps J.J. Redick, who was out with the flu, should replace Carter as a starter. But Carter was attacking the basket, which he hardly does anymore, and carrying on a conversation with courtside fans and responding to their taunts. Boozer only attempted five shots, hardly a good sample, and Noah did get into foul trouble with three by the middle of the second quarter. The Bulls opened that second quarter with defensive three second technicals on consecutive possessions as the madness and confusion continued. This was the team that just finished the Western Conference road trip 4-3? Kyle Korver shot an air ball, Brewer missed a open layup, Boozer front rimmed a postup jumper, Boozer posted up on Brandon Bass and Nelson slapped Boozer’s hand and the ball. At least Boozer didn’t encounter any carryover from the injury and seemed to come out of the game with his hand sturdy, if not quite strong yet. Kurt Thomas made a rare appearance for a couple of minutes and James Johnson got in and filled up the box score with his usual array of impressive athletic moves and head scratching decisions with the ball that usually end up with it going the other way. He was three of five in 15 minutes with two blocks and four turnovers. 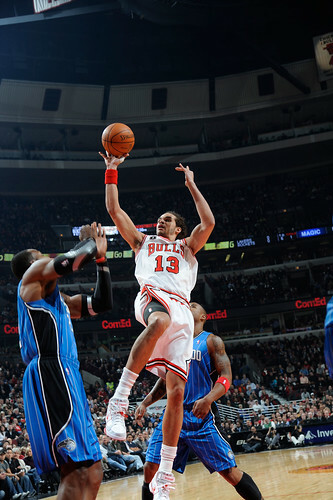 Noah led the Bulls with 16 points as Howard didn’t care to follow Noah outside and Noah had his elbow jumper going. So Noah did have another double double: In points and shot attempts. Orlando led by 24 at halftime and pretty much lost interest after that as they settled into their jump shooting contests. The Bulls made a little run to open the fourth with Gibson, now coming off the bench, converting three baskets (he was a solid five of eight for 10 points) and Johnson with a pair of blocks, but then hanging on the rim on a dunk attempt for offensive interference and a couple of unforced turnovers. Korver teamed with Brewer on an out of bounds pass, and the fans came, they saw and they left with about six minutes remaining. The Bulls hope sooner than later.